The Broncos were barely competitive during their 10-year run in the AFL and their first seven years in the NFL. They did not complete a winning season until 1973. 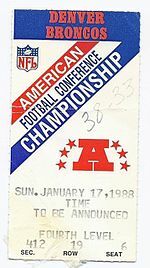 In 1977, four years later, they qualified for the playoffs for the first time in franchise history and advanced to Super Bowl XII. Since 1975, the Broncos have become one of the NFL's most successful teams, having suffered only seven losing seasons. They have won eight AFC Championships (1977, 1986, 1987, 1989, 1997, 1998, 2013, 2015), and three Super Bowl championships (1997 (XXXII), 1998 (XXXIII), 2015 (50)), and share the NFL record for most Super Bowl losses (5 — tied with the New England Patriots). They have ten players in the Pro Football Hall of Fame: John Elway, Floyd Little, Shannon Sharpe, Gary Zimmerman, Willie Brown, Tony Dorsett, Terrell Davis, Brian Dawkins, Ty Law and Champ Bailey. The Denver Broncos were founded on August 14, 1959, when Minor League Baseball owner Bob Howsam was awarded an American Football League (AFL) charter franchise. The Broncos won the first-ever AFL game over the Boston Patriots 13–10, on September 9, 1960. On August 5, 1967, they became the first-ever AFL team to defeat an NFL team, with a 13–7 win over the Detroit Lions in a preseason game. However, the Broncos were not successful in the 1960s, compiling a record of 39–97–4 in the league. Denver came close to losing its franchise in 1965, until a local ownership group took control and rebuilt the team. The team's first superstar, "Franchise" Floyd Little, was instrumental in keeping the team in Denver, due to his signing in 1967 as well as his Pro Bowl efforts on and off the field. The Broncos were the only original AFL team that never played in the title game, as well as the only original AFL team never to have a winning season while a member of the AFL during the upstart league's 10-year history. In 1972, the Broncos hired former Stanford University coach John Ralston as their head coach. In 1973, he was the UPI's AFC Coach of the Year, after Denver achieved its first winning season at 7–5–2. In five seasons with the Broncos, Ralston guided the team to winning seasons three times. Though Ralston finished the 1976 season with a 9–5 record, the team, as was the case in Ralston's previous winning seasons, still missed the playoffs. Following the season, several prominent players publicly voiced their discontent with Ralston, which soon led to his resignation. The Broncos defeated the Raiders in the 1977–78 AFC Championship Game to earn their first trip to the Super Bowl. Red Miller, a long-time assistant coach was hired and along with the Orange Crush Defense (a nickname originated in 1977, also the brand of the popular orange-flavored soft drink) and aging quarterback Craig Morton, took the Broncos to what was then a record-setting 12–2 regular season record and their first playoff appearance in 1977, and ultimately first Super Bowl, in which they were defeated by the Dallas Cowboys (Morton's former team), 27–10. In 1981, Broncos' owner Gerald Phipps, who had purchased the team in May 1961 from the original owner Bob Howsam, sold the team to Canadian financier Edgar Kaiser Jr., grandson of shipbuilding industrialist Henry J. Kaiser. In 1984, the team was purchased by Pat Bowlen, who placed team ownership into a family trust sometime before 2004 and remained in day-to-day control until his battle with Alzheimer's disease forced him to cede the team to Joe Ellis in 2014. Dan Reeves became the youngest head coach in the NFL when he joined the Broncos in 1981 as vice president and head coach. Quarterback John Elway, who played college football at Stanford, arrived in 1983 via a trade. Originally drafted by the Baltimore Colts as the first pick of the draft, Elway proclaimed that he would shun football in favor of baseball (he was drafted by the New York Yankees to play center field and was also a pitching prospect), unless he was traded to a selected list of other teams, which included the Broncos. Prior to Elway, the Broncos had over 24 different starting quarterbacks in its 23 seasons to that point. Jonh Elway (right) hands the ball for a rushing play against the Packers in 1984. Reeves and Elway guided the Broncos to six post-season appearances, five AFC West divisional titles, three AFC championships and three Super Bowl appearances (Super Bowl XXI, XXII and XXIV) during their 12-year span together. The Broncos lost Super Bowl XXI to the New York Giants, 39–20; Super Bowl XXII to the Washington Redskins, 42–10; and Super Bowl XXIV to the San Francisco 49ers, 55–10; the latter score remains the most lopsided scoring differential in Super Bowl history. The last year of the Reeves-Elway era were marked by feuding, due to Reeves taking on play-calling duties after ousting Elway's favorite offensive coordinator Mike Shanahan after the 1991 season, as well as Reeves drafting quarterback Tommy Maddox out of UCLA instead of going with a wide receiver to help Elway. Reeves was fired after the 1992 season and replaced by his protégé and friend Wade Phillips, who had been serving as the Broncos' defensive coordinator. Phillips was fired after a mediocre 1994 season, in which management felt he lost control of the team. In 1995, Mike Shanahan, who had formerly served under Reeves as the Broncos' offensive coordinator, returned as head coach. Shanahan drafted rookie running back Terrell Davis. In 1996, the Broncos were the top seed in the AFC with a 13–3 record, dominating most of the teams that year. The fifth-seeded Jacksonville Jaguars, however, upset the Broncos 30–27 in the divisional round of the playoffs, ending the Broncos' 1996 run. During the 1997 season, Elway and Davis helped guide the Broncos to their first Super Bowl victory, a 31–24 win over the defending champion Green Bay Packers in Super Bowl XXXII. Though Elway completed only 13 of 22 passes, throwing one interception and no touchdowns (he did, however, have a rushing touchdown), Davis rushed for 157 yards and a Super Bowl–record three touchdowns to earn the Super Bowl Most Valuable Player Award—this while overcoming a severe migraine headache that caused him blurred vision. The Broncos repeated as Super Bowl champions the following season, defeating the Atlanta Falcons (led by Elway's longtime head coach Dan Reeves) in Super Bowl XXXIII, 34–19. Elway was named Super Bowl MVP, completing 18 of 29 passes for 336 yards, with an 80-yard touchdown to wide receiver Rod Smith and one interception. Broncos' quarterback Jay Cutler in 2007. John Elway retired following the 1998 season, and Brian Griese started at quarterback for the next four seasons. After a 6–10 record in 1999, the Broncos recovered in 2000, earning a Wild Card playoff berth, but losing to the eventual Super Bowl champion Baltimore Ravens. After missing the playoffs the following two seasons, former Arizona Cardinals' quarterback Jake Plummer replaced Griese in 2003, and led the Broncos to two straight 10–6 seasons, earning Wild Card playoff berths both years. However, the Broncos went on the road to face the Indianapolis Colts in back-to-back seasons and were blown out by more than 20 points in each game, allowing a combined 90 points. Plummer led the Broncos to a 13–3 record in 2005 and their first AFC West division title since 1998. After a first-round bye, the Broncos defeated the defending Super Bowl champion New England Patriots, 27–13, denying New England from becoming the first NFL team ever to win three consecutive Super Bowl championships. The Broncos' playoff run came to an end next week, after losing at home to the Pittsburgh Steelers in the AFC Championship game, 34–17. The Steelers went on to win Super Bowl XL. The Broncos' defense began the first five games of the 2006 season allowing only one touchdown—an NFL record, but struggled down the season stretch. Plummer led the team to a 7–2 record, only to struggle and be replaced by rookie quarterback Jay Cutler. Cutler went 2–3 as a starter, and the Broncos finished with a 9–7 record, losing the tiebreaker to the Kansas City Chiefs for the final playoff spot. Cutler's first full season as a starter in 2007 became the Broncos' first losing season since 1999, with a 7–9 record. The 2008 season ended in a 52–21 loss at the San Diego Chargers, giving the Broncos an 8–8 record and their third straight season out of the playoffs. Mike Shanahan, the longest-tenured and most successful head coach in Broncos' franchise history, was fired after 14 seasons. On January 11, 2009, two weeks after Shanahan was fired, the Broncos hired former New England Patriots' offensive coordinator Josh McDaniels as the team's new head coach. Three months later, the team acquired quarterback Kyle Orton as part of a trade that sent Jay Cutler to the Chicago Bears. Under McDaniels and Orton, the Broncos jumped out to a surprising 6–0 start in 2009. However, the team lost eight of their next ten games, finishing 8–8 for a second consecutive season and missing the playoffs. The next season (2010), the Broncos set a new franchise record for losses in a single season, with a 4–12 record. McDaniels was fired before the end of the 2010 season following a combination of the team's poor record and the fallout from a highly publicized videotaping scandal. Running backs coach Eric Studesville was named interim coach for the final four games of the 2010 season. He chose to start rookie first-round draft choice Tim Tebow at quarterback for the final three games. Following the 2010 season, Joe Ellis was promoted from Chief Operating Officer to team president, while John Elway returned to the organization as the team's Executive Vice President of Football Operations. In addition, the Broncos hired John Fox as the team's 14th head coach. Fox previously served as the Carolina Panthers' head coach from 2002 to 2010. 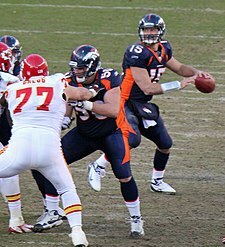 Following a 1–4 start to the 2011 season, Tim Tebow replaced Kyle Orton as the Broncos' starting quarterback, and led the Broncos to an 8–8 record and the team's first playoff berth and division title since 2005. The Broncos defeated the Pittsburgh Steelers in the Wild Card round on a memorable 80-yard touchdown pass from Tebow to wide receiver Demaryius Thomas on the first play of overtime, setting a record for the fastest overtime in NFL history. However, the Broncos were blown out by the New England Patriots in the Divisional round. In March 2012, the Broncos reached an agreement on a five-year, $96 million contract with former longtime Indianapolis Colts' quarterback Peyton Manning, who had recently missed the entire 2011 season following multiple neck surgeries. This resulted in the Broncos subsequently trading incumbent quarterback Tim Tebow to the New York Jets. The Broncos finished with a 13–3 record and the AFC's No. 1 seed in the 2012 playoffs, but were defeated by the Baltimore Ravens in the Divisional round. Like 2012, the Broncos finished with a 13–3 record and the AFC's No. 1 seed in 2013. In the 2013 playoffs, the Broncos defeated the San Diego Chargers in the Divisional round and the New England Patriots in the AFC Championship. However, the Broncos were soundly defeated by the Seattle Seahawks in Super Bowl XLVIII by a score of 43–8, the Broncos' first Super Bowl berth since winning back-to-back Super Bowls in 1997 and 1998. Prior to the start of the 2014 season, the Broncos announced that Pat Bowlen, the team's owner since 1984, relinquished control of the team due to his battle with Alzheimer's disease, resulting in team president Joe Ellis and general manager John Elway assuming control of the team. The Broncos finished the 2014 season with a 12–4 record and the AFC's No. 2 seed. However, the Broncos were defeated by the Indianapolis Colts in the Divisional round of the 2014 playoffs, marking the third time in four seasons that the Broncos lost in the Divisional round of the playoffs. Quarterback Peyton Manning had been playing with strained quadriceps for the final month of the 2014 season. On January 12, 2015, one day after the aforementioned Divisional playoff loss to the Colts, the Broncos and head coach John Fox mutually agreed to part ways. Fox left the Broncos with a .719 winning percentage in his four seasons as the Broncos' head coach—the highest in franchise history. One week later, the Broncos hired Gary Kubiak as the team's 15th head coach. 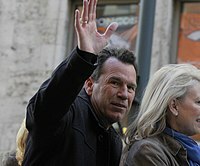 Kubiak served as a backup quarterback to executive vice president/general manager John Elway from 1983 to 1991, as well as the Broncos' offensive coordinator from 1995 to 2005. Shortly after Kubiak became head coach, the Broncos underwent numerous changes to their coaching staff, including the hiring of defensive coordinator Wade Phillips, under whom the Broncos' defense ranked No. 1 in the NFL during the 2015 season. The Broncos finished with a 12–4 record and the AFC's No. 1 seed, despite Peyton Manning having his worst statistical season since his rookie year with the Indianapolis Colts in 1998 and backup quarterback Brock Osweiler starting the last six games of the regular season due to Manning suffering from a foot injury. Manning led the Broncos throughout the playoffs. The Broncos defeated the Pittsburgh Steelers 23–16 in the Divisional Round, the New England Patriots 20–18 in the AFC Championship, and defeated the Carolina Panthers 24–10 in Super Bowl 50—the Broncos' third Super Bowl title. On March 7, 2016, quarterback Peyton Manning retired after 18 NFL seasons during a press conference at the team's Dove Valley headquarters. Following Manning's retirement, the Broncos have undergone changes at the quarterback position, including the free agent departure of backup quarterback Brock Osweiler to the Houston Texans, the trade acquisition of Mark Sanchez from the Philadelphia Eagles and the selection of Paxton Lynch during the 2016 draft. Sanchez, Lynch and second-year quarterback Trevor Siemian competed for the starting quarterback spot during the off-season and preseason; however, Sanchez was released and Siemian was named the starter prior to the start of the season. The Broncos finished the season 9–7 and missed the playoffs for the first time since 2010. On January 2, 2017, coach Gary Kubiak announced his retirement, citing health as the main reason for retiring. The Broncos later hired Vance Joseph as head coach on January 11, 2017. The Broncos finished 5–11 in 2017 due to a poor offense, and signed quarterback Case Keenum in 2018. After getting off to a strong start, their 2018 season was mostly up and down, eventually finishing with a 6-10 record and third place in the AFC West. Coupled with the 5-11 season in 2017, the Broncos had back-to-back losing seasons for the first time since 1971-1972. Shortly after finishing the regular season, head coach Vance Joseph was fired after having only an 11-21 record in two seasons. On January 10, 2019, the Denver Broncos came to terms with Chicago Bears defensive coordinator Vic Fangio to become the 17th head coach in franchise history. On February 13, 2019, it was announced that Joe Flacco is the new quarterback of the Denver Broncos. The Denver Broncos have three AFC West rivals—the Kansas City Chiefs, Los Angeles Chargers and Oakland Raiders. All teams, along with the Broncos, were charter members of the American Football League (AFL), with each team placed in the AFL Western Division. The Broncos were barely competitive during the AFL years (1960–69), going a combined 10–49–1 against the Chiefs, Chargers and Raiders. The Broncos have had several memorable matchups with the Chiefs, particularly during the years in which John Elway was the Broncos' starting quarterback (1983–98). The Broncos defeated the Chiefs at Arrowhead Stadium in the divisional round of the 1997 NFL playoffs, en route to their first Super Bowl victory. The Chiefs currently hold a 63–55 series lead over the Broncos, including the aforementioned 1997 divisional playoff game. The rivalry with the Raiders was ignited in 1977, when the Broncos advanced to their first Super Bowl by defeating the defending champion Raiders in the 1977 AFC Championship. The rivalry intensified in the mid-1990s, when Mike Shanahan was hired as the Broncos' head coach in 1995. Shanahan coached the Raiders in 1988 before being fired four games into the 1989 season. The Raiders currently hold a 64–53–2 series lead over the Broncos, including 1–1 in the playoffs. Unlike their records against the Chiefs and Raiders, the Broncos currently have a winning record against the Chargers, with a 66–52–1 series lead, including 1–0 in the playoffs. The Broncos pulled off one of the largest comebacks in Monday Night Football history, when Peyton Manning led the Broncos from a 24–0 halftime deficit to a 35–24 win at San Diego's Qualcomm Stadium during the 2012 season. The two teams met in the playoffs for the first time on January 12, 2014, at Denver's Sports Authority Field at Mile High, with the Broncos winning 24–17. The Broncos had an old rivalry with the Seattle Seahawks, who were members of the AFC West from 1977 to 2001, prior to the Seahawks' move to the NFC West as part of the NFL's 2002 re-alignment. During the 25 years in which the Seahawks resided in the AFC West, the Broncos went 32–18 against the Seahawks, including a loss at Seattle in the 1983 NFL playoffs. Since 2002, the Broncos have won three of five interconference meetings, and the two teams met in Super Bowl XLVIII on February 2, 2014, with the Seahawks winning by a score of 43–8. Aside from the aforementioned AFC West teams, the Broncos have had intra-conference rivalries over the years with the Cleveland Browns, Pittsburgh Steelers and New England Patriots. The Broncos had a brief rivalry with the Browns that arose from three AFC championship matches in 1986, 1987 and 1989. In the 1986 AFC Championship, quarterback John Elway led The Drive to secure a tie in the waning moments at Cleveland Municipal Stadium; the Broncos went on to win in 23–20 in overtime. One year later, the two teams met again in the 1987 AFC Championship at Mile High Stadium. Denver took a 21–3 lead, but Browns' quarterback Bernie Kosar threw four touchdown passes to tie the game at 31–31 halfway through the 4th quarter. After a long drive, John Elway threw a 20-yard touchdown pass to running back Sammy Winder to give Denver a 38–31 lead. Cleveland advanced to Denver's 8-yard line with 1:12 left, but Broncos' safety Jeremiah Castille stripped Browns' running back Earnest Byner of the football at the 2-yard line—a play that has been called The Fumble by Browns' fans. The Broncos recovered it, gave Cleveland an intentional safety, and went on to win 38–33. The two teams met yet again in the 1989 AFC Championship at Mile High Stadium, which the Broncos easily won by a score of 37–21. The Broncos did not win the Super Bowl after any of the championship games where they defeated the Browns, losing by an aggregate of 136–40. As of the end of the 2015 season, the Broncos and Steelers have met in postseason play eight times, tied with four other pairings for the second–most frequent playoff matchups in NFL playoff history. The Broncos currently own a 5–3 playoff record vs. the Steelers. Perhaps the most memorable postseason matchup occurred in the 1997 AFC Championship, in which the Broncos defeated the Steelers 24–21 at Three Rivers Stadium, en route to their first Super Bowl victory. Eight years later, the Steelers returned the favor at INVESCO Field at Mile High, defeating the Broncos 34–17 in the 2005 AFC Championship, and subsequently won Super Bowl XL. In the Wild Card round of the 2011 playoffs, in a game dubbed The 3:16 game, the Broncos stunned the Steelers 29–23 on the first play of overtime, when quarterback Tim Tebow connected with wide receiver Demaryius Thomas on an 80-yard game-winning touchdown pass. The teams met again in the Divisional round of the 2015 playoffs at Denver, where the Broncos defeated the Steelers 23–16 on their way to a victory in Super Bowl 50. The Broncos and Patriots met twice annually during the American Football League (AFL) years from 1960 to 1969, and played in the first-ever AFL game on September 9, 1960. Since 1995, the two teams have met frequently during the regular season, including nine consecutive seasons from 1995 to 2003. As of the end of the 2015 season, the two teams have met in the playoffs five times, with the Broncos owning a 4–1 record. The teams' first playoff match on January 4, 1987 was John Elway's first career playoff win, while the teams' second playoff match on January 14, 2006 game was the Broncos' first playoff win since Elway's retirement after the 1998 season. The game was also notable for Champ Bailey's 100-yard interception that resulted in a touchdown-saving tackle by Benjamin Watson at the 1-yard line. On October 11, 2009, the two teams met with former Patriots' offensive coordinator, Josh McDaniels as the Broncos' head coach. Both teams wore their AFL 50th anniversary jerseys. The game featured a 98-yard drive in the fourth quarter, with a game-tying touchdown pass from Kyle Orton to Brandon Marshall, followed by an overtime drive led by Orton that resulted in a 41-yard game-winning field goal by Matt Prater. The two teams met in the Divisional round of the 2011 playoffs, with the Patriots blowing out Tim Tebow and the Broncos by a score of 45–10. The Broncos' rivalry with the Patriots later intensified when longtime Indianapolis Colts' quarterback Peyton Manning became the Broncos' starting quarterback from 2012 to 2015. Manning and Patriots' quarterback Tom Brady maintained a legendary rivalry from 2001 until Manning's retirement after the 2015 season. Though Brady dominated Manning in regular season play, winning nine of twelve meetings, Manning won three of five playoff meetings, the last of which was a Broncos' 20–18 win in the 2015 AFC Championship. 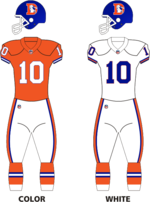 Denver Broncos uniform set from 1968 to 1996. The logo was designed by Edwin Guy Taylor of Denver. A contest was held through Public Service of Denver to come up with a new logo for the team. Mr. Taylor's submission was selected late in 1967 and adopted soon after. The team briefly wore orange pants with the away jerseys between 1969–1971 and 1978–1979. When the Broncos debuted in 1960, their original uniforms drew as much attention as their play on the field. They featured white and mustard yellow jerseys, with contrasting brown helmets, brown pants and vertically striped socks. Two years later, the team unveiled a new logo featuring a bucking horse, and changed their team colors to orange, royal blue and white. The 1962 uniform consisted of white pants, orange helmets, and either orange or white jerseys. In 1968, the Broncos debuted a design that became known as the "Orange Crush." Their logo was redesigned so that the horse was coming out of a "D." Additionally, the helmets were changed to royal blue, with thin stripes placed onto the sleeves, and other minor modifications were added. From 1969 to 1971, and again from 1978 to 1979, the team wore orange pants with their white jerseys. The Broncos wore their white jerseys at home throughout the 1971 season, as well as for 1980 home games vs. the San Diego Chargers and Dallas Cowboys, the latter in hopes to bring out the "blue jersey jinx" which has followed the Cowboys for decades (it worked, the Broncos won 41–20). The Broncos wore their white jerseys for 1983 home games vs. the Philadelphia Eagles, Los Angeles Raiders and Cincinnati Bengals, but did not wear white at home again for two decades — see next section. In 1994, in honor of the 75th anniversary season of the NFL, the Broncos wore their 1965 throwback uniforms for two games—a Week 3 home game against the Raiders, as well a road game at the Buffalo Bills the following week. The Broncos radically changed their logo and uniforms in 1997, a design that the team continues to use to this day. The new logos and uniforms were unveiled on February 4, 1997. Navy blue replaced royal blue on the team's color scheme. The current logo is a profile of a horse's head, with an orange mane and navy blue outlines. The Broncos' popular live animal mascot Thunder was the inspiration to incorporate a horse-head profile as part of the logo on the team's helmets. During a February 4, 1997 press conference introducing the new logo, the team president and the art director for Nike, who were the creators of the new design, described it as "a powerful horse with a fiery eye and mane." The Broncos began wearing navy blue jerseys, replacing their longtime orange jerseys that had been the team's predominant home jersey color since 1962. This new uniform design features a new word mark, numbering font and a streak that runs up and down the sides of both the jerseys and the pants. On the navy blue jerseys, the streak is orange, with an orange collar and white numerals trimmed in orange, while on the road white jerseys, the streak is navy blue, with a thin orange accent strip on both sides, a navy collar and navy numerals trimmed in orange. When they debuted, these uniforms were vilified by the press and fans, until the Broncos won their first ever Super Bowl in the new design that same season. The navy blue jerseys served as the team's primary home jersey until the end of the 2011 season — see next section. In 2002, the Broncos introduced an alternate orange jersey that is a mirror image of the aforementioned navy blue jerseys, but with orange and navy trading places. Like the road white jerseys, the white pants with the navy blue streaks running down the sides are worn with this uniform. This jersey was used only once in the 2002 and 2004 seasons, and were used twice per season from 2008 to 2011. Mike Shanahan, the team's head coach from 1995 to 2008, was not a big fan of the alternate orange jerseys. The Broncos previously wore orange jerseys as a throwback uniform in a Thanksgiving Day game at the Dallas Cowboys in 2001. The team also introduced navy blue pants in 2003, with orange side streaks to match with the navy blue jerseys. Though they were part of the uniform change in 1997 (in fact, they were worn for a couple of 1997 preseason games) and most players wanted to wear them, the only player who vetoed wearing them was John Elway, thereby delaying their eventual introduction. From 2003 to 2011, these pants were primarily used for select prime-time and late-season home games (excluding the 2008 season), and since 2012, are used exclusively with the now-alternate navy blue jerseys — see next section. On November 16, 2003, the Broncos wore their white jerseys at home for the first time since 1983, in a game vs. the San Diego Chargers. This was compensation for a uniform mix-up, after the teams' first meeting at San Diego's Qualcomm Stadium in Week 2 earlier that season, when the Chargers were the team that was supposed to declare their uniform color. The Chargers were planning to wear their white jerseys, but the visiting Broncos came to the stadium in white, and were fined $25,000 by the NFL as a result. When the two teams met at INVESCO Field at Mile High later that season (Week 11), the NFL allowed the visiting Chargers to choose their uniform color in advance, and they chose navy blue, forcing the Broncos to wear their white jerseys at home. In 2009, in honor of their 50th anniversary season as one of the eight original American Football League teams, the Broncos wore their 1960 throwback uniforms (brown helmets, mustard yellow and brown jerseys) for games against two fellow AFL rivals—a Week 5 home game vs. the New England Patriots, as well as the following week at the San Diego Chargers. Beginning in 2012, the orange jerseys that served as the alternate colored jerseys from 2002 to 2011 became the primary home jersey, while the navy blue jerseys that served as the primary home jersey from 1997 to 2011 switched to alternate designation. The change was made due to overwhelming popularity with the fans, who pressured the Broncos to return to orange as the team's primary home jersey color. Since the 2012 uniform change, the team has worn the alternate navy blue jerseys for at least one home game per season, with the exception of 2013, in which the Broncos wore their alternate navy blue uniforms for an October 6, 2013 road game at the Dallas Cowboys, which the Broncos won in a shootout, 51-48. The team will either wear the navy blue or the white pants — with the orange side stripes — to match with the alternate navy blue jerseys. The team initially did not wear the white pants with the orange side stripes, until a November 1, 2015 game vs. the Green Bay Packers, in which the Broncos wore said design in order to match the uniform ensemble that was used during the team's Super Bowl XXXII win over the Packers. As the designated home team in Super Bowl 50, the Broncos — who have an 0–4 Super Bowl record when using their standard orange jerseys — chose to wear their white jerseys as the designated "home" team. In 2016, the Broncos' unveiled a new Color Rush uniform, which the team wore for a Thursday Night game at the San Diego Chargers on October 13, 2016. The uniform kit contained the following features: orange pants, which the team wore for the first time since 1979, orange socks and shoes, along with block-style numerals trimmed in navy blue that mirrored the team's 1968–1996 uniform style. Due to the NFL's one-helmet rule implemented in 2013, the helmets remained the same, with the team temporarily replacing the modern primary logo with the throwback "D-horse" logo. The same uniform was used for a Thursday Night game against the Indianapolis Colts during the 2017 season and again during a 2018 game against the Pittsburgh Steelers. For most of their history, the Denver Broncos played in Mile High Stadium. 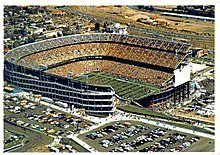 The AFL Broncos played at the University of Denver's Hilltop Stadium from time to time, including the first-ever victory of an AFL team over an NFL team: The Broncos beat the Detroit Lions on August 5, 1967, in a preseason game. The team has sold out every home game (including post-season games) since the AFL–NFL merger in 1970, with the exception of two replacement games during the 1987 strike (but both were sold out before the strike). During home games, the attendance is announced to the crowd, along with the number of no-shows (the fans subsequently boo the no-shows). The fans are also known to chant "IN-COM-PLETE!" every time the visiting team throws an incomplete pass. The stadium's legendary home-field advantage is regarded as one of the best in the NFL, especially during the playoffs. The Broncos had the best home record in pro football over a 32-year span from 1974 to 2006 (191–65–1). Mile High Stadium was one of the NFL's loudest stadiums, with steel flooring instead of concrete, which may have given the Broncos an advantage over opponents, plus the advantage of altitude conditioning for the Broncos. 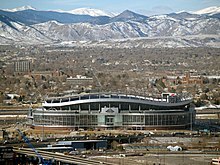 In 2001, the team moved into Invesco Field at Mile High, built next to the former site of the since-demolished Mile High Stadium. Sportswriter Woody Paige, along with many of Denver's fans, however, often refuse to call the new stadium by its full name, preferring to use "Mile High Stadium" because of its storied history and sentimental import. Additionally, The Denver Post had an official policy of referring to the stadium as simply "Mile High Stadium" in protest, but dropped this policy in 2004. Prior to the 2011 season, Englewood-based sporting goods retailer Sports Authority claimed the naming rights of Invesco Field, which became known as Sports Authority Field at Mile High. However, in the summer of 2016, Sports Authority went bankrupt, the stadium was renamed Broncos Stadium at Mile High, and the Broncos have been seeking a new corporate sponsor for their stadium ever since. The altitude has also been attributed as part of the team's home success. The stadium displays multiple references to the stadium's location of 5,280 feet (1.000 mi) above sea level, including a prominent mural just outside the visiting team's locker room. The team training facility, the UCHealth Training Center (formerly known as the Paul D. Bowlen Memorial Broncos Centre), is a state-of-the-art facility located in Dove Valley. With 13.5 acres of property, the facility hosts three full-size fields, a complete weight and training facility, and a cafeteria. In their more than half-century of existence, the Broncos have never been shut out at home, a streak of over 400 games as of the 2016 season. In late 2012, the Broncos announced that the stadium would receive $30 million upgrades including a new video board in the south end zone three times larger than the previous display. The renovations were finished before kickoff of the 2013 season. The Denver Broncos announced the club's 50th anniversary team on September 15, 2009. The anniversary team was voted on by users at DenverBroncos.com from June 6 – September 4, 2009. † Note: No. 18 was re-issued for Peyton Manning after Tripucka gave his approval; it was used by Manning from the 2012 season until his retirement after the 2015 season. Manning's name was added to the retired number's banner as an honorable mention. The Broncos' flagship radio station is currently KOA, 850AM, a 50,000-watt station owned by Clear Channel Communications. Dave Logan is the play-by-play announcer, with former Broncos' wide receiver Ed McCaffrey serving as the color commentator beginning in 2012, replacing Brian Griese. Until 2010, preseason games not selected for airing on national television were shown on KCNC, channel 4, which is a CBS owned-and-operated station, as well as other CBS affiliates around the Rocky Mountain region. On May 26, 2011, the Broncos announced that KUSA channel 9, an NBC affiliate also known as 9NEWS in the Rocky Mountain region, will be the team's new television partner for preseason games. In 2011, the Broncos began a partnership with KJMN, 92.1 FM, a leading Spanish language radio station owned by Entravision Communications (EVC). The partnership also includes broadcasting rights for a half-hour weekly TV show on KCEC, the local Univision affiliate operated by Entravision Communications. Tim McKernan, a.k.a. Barrel Man, began wearing a barrel in 1977 after making a $10 (equivalent to $40 in 2018) bet with his brother, Scott, that by wearing one he could get on television. McKernan won the bet, and the barrel he had painted to look like an Orange Crush soda can became his signature costume, and resulted in him becoming one of the Broncos' most recognized fans and a popular mascot. McKernan died on December 5, 2009. The animated television show South Park, set in Park County, often mentions the Denver Broncos; show creators Trey Parker and Matt Stone both grew up in Colorado as devout Broncos fans. In The Simpsons 1996 episode "You Only Move Twice", Hank Scorpio gives Homer Simpson the Denver Broncos as a thank-you gift for helping him. Homer complains that he wanted to own the Dallas Cowboys, as the Broncos team that just arrived are playing very sloppy football on his front lawn (a reference to the team losing four Super Bowl appearances, three by significant margins including Super Bowl XII against Dallas). Incidentally, the Broncos were 13–3 in the 1996 season, and won the Super Bowl the next two seasons. Only two seasons later in the Super Bowl-centric episode "Sunday, Cruddy Sunday", Homer chooses Denver as his Super Bowl XXXIII pick over Moe's choice of the Atlanta Falcons. In the episode, "The Bonfire of the Manatees", Homer picks the Broncos to win the Super Bowl over the Seattle Seahawks. The two teams later did play against each other in Super Bowl XLVIII which aired on Fox, the U.S. home of The Simpsons. In the 1979 Mork & Mindy episode "Hold That Mork", Mork's character, played by Robin Williams, became the first male cheerleader in Broncos' history. As a member of the "Pony Express", he trotted out on the field at Mile High Stadium during an actual Broncos' game vs. the New England Patriots on November 11, 1979. The episode aired exactly two weeks later. Many former Broncos are now in broadcasting, including Shannon Sharpe, Mark Schlereth, Alfred Williams, Tom Jackson, Ed McCaffrey, Brian Griese, David Diaz-Infante, Terrell Davis and Brandon Stokley. Former tight end and receiver Nate Jackson has written and published two nonfiction books, Slow Getting Up and Fantasy Man. His writing about the NFL has appeared in Slate, Deadspin, The Daily Beast, The New York Times, The Wall Street Journal, and BuzzFeed, among others. Jackson also co-hosts the Caveman Poet Society. ^ "The Broncos Are Born". DenverBroncos.com. NFL Enterprises, LLC. Retrieved August 21, 2017. ^ The postal designation of Englewood, a city eight (8) miles west, is used in the headquarters' mailing address. "Contact Info". DenverBroncos.com. NFL Enterprises, LLC. Retrieved June 27, 2018. ^ "Denver Broncos Team Capsule" (PDF). 2018 Official National Football League Record and Fact Book. NFL Enterprises, LLC. August 9, 2018. Retrieved November 21, 2018. ^ "Broncos Directory" (PDF). 2014 Denver Broncos Media Guide. NFL Enterprises, LLC. July 8, 2014. Retrieved August 2, 2018. ^ a b Wesseling, Chris (July 23, 2014). "Denver Broncos owner Pat Bowlen stepping back". NFL.com. NFL Enterprises, LLC. Retrieved July 25, 2017. ^ a b "Statements on Owner Pat Bowlen". DenverBroncos.com. NFL Enterprises, LLC. July 23, 2014. Archived from the original on July 24, 2014. Retrieved June 29, 2018. ^ "Denver Broncos Team Encyclopedia – Pro-Football-Reference.com". Pro-Football-Reference.com. ^ a b "Team – Pro Football Hall of Fame". Pro Football Hall of Fame. Retrieved November 28, 2008. ^ "Denver Broncos: American Football League Charter Members". Conigliofamily.com. Retrieved November 28, 2008. ^ "Denver Broncos Team History". NFLteamhistory.com. Archived from the original on October 3, 2008. Retrieved November 28, 2008. ^ "Denver Broncos Team Encyclopedia – Pro Football Reference". ^ a b c "Sports E-Cyclopedia – Denver Broncos". ^ "1977 Denver Broncos Statistics". Pro Football Reference. ^ Paton, James. "Clock runs out for ex-Broncos owner". Rocky Mountain News. Archived from the original on October 4, 2008. Retrieved October 2, 2008. ^ a b Klis, Mike (July 23, 2014). "Pat Bowlen resigns control of Denver Broncos, acknowledges he is dealing with Alzheimer's disease". The Denver Post. Retrieved July 23, 2014. ^ "John Elway Timeline". The Sporting News. Archived from the original on September 20, 2008. Retrieved November 28, 2008. ^ "Denver Broncos". Football.com. Archived from the original on June 5, 2008. Retrieved November 28, 2008. ^ "RealClearSports – Top 10 Coach Killers – John Elway". ^ Reid Brooks. "Mile High Feud: John Elway and Mike Shanahan Still Have a Beef, but Why?". Bleacher Report. ^ a b "Reeves' comments rekindle feud with Elway, Shanahan". CNN/SI. January 24, 1999. Archived from the original on June 22, 2011. ^ "Super Bowl XXXII box score". NFL.com. Retrieved November 28, 2008. ^ "Shanahan, Broncos Part Ways". Denver Broncos. December 30, 2008. Retrieved December 30, 2008. ^ "Broncos Introduce McDaniels". Denver Broncos. January 11, 2009. Retrieved January 11, 2009. ^ Stapleton, Arnie (January 3, 2011). "Broncos lose franchise-record 12th game as Chargers win 33–28". Fox 31 Denver. Archived from the original on October 6, 2011. Retrieved January 3, 2011. ^ Klis, Mike (December 6, 2010). "McDaniels fired as Broncos coach after controversy, losses pile up". The Denver Post. Retrieved December 6, 2010. ^ Klis, Mike (January 5, 2011). "Broncos officially announce Elway hire, promote Ellis to president". The Denver Post. Retrieved January 5, 2011. ^ Caldwell, Gray (January 13, 2011). "Fox Takes the Reins". Denver Broncos. Retrieved January 13, 2011. ^ a b Klis, Mike (January 14, 2012). "Tom Brady leads Patriots' 45–10 rout of Broncos, Tim Tebow in NFL playoffs". The Denver Post. Retrieved January 14, 2012. ^ "Peyton Manning, Broncos OK deal". ESPN. March 20, 2012. Retrieved March 20, 2012. ^ "Jets acquire Tim Tebow for draft pick". ESPN. March 22, 2012. Retrieved March 22, 2012. ^ Caldwell, Gray; Zaas, Stuart (January 12, 2013). "Double-OT Heartbreaker Ends Denver's Season". Denver Broncos. Retrieved January 12, 2013. ^ Klis, Mike (February 2, 2014). "Broncos, Peyton Manning struggle in Super Bowl blowout by Seahawks". The Denver Post. Retrieved February 2, 2014. ^ Schefter, Adam (January 12, 2015). "Peyton was injured for past month". ESPN. Retrieved January 12, 2015. ^ Wesseling, Chris (January 12, 2015). "John Fox, Denver Broncos part ways after four seasons". NFL.com. Retrieved January 12, 2015. ^ "NFL.com Statistics". NFL.com. January 4, 2016. Retrieved March 26, 2016. ^ Renck, Troy (February 7, 2016). "Von Miller, defense carry Broncos to Super Bowl 50 victory". The Denver Post. Retrieved February 7, 2016. ^ Renck, Troy (March 7, 2016). "Peyton Manning retires from football: "I love the game...I will miss it."". The Denver Post. Archived from the original on March 9, 2016. Retrieved September 8, 2016. ^ Patra, Kevin. "Broncos coach Gary Kubiak retires from coaching". NFL.com. Retrieved January 2, 2017. ^ Mason, Andrew (January 11, 2017). "Broncos appoint Vance Joseph, 'a leader of men,' as new head coach". DenverBroncos.com. NFL Enterprises, LLC. Retrieved October 16, 2017. ^ Pelissero, Tom (January 11, 2017). "Vance Joseph hired as Broncos' new head coach". USA TODAY. Retrieved October 16, 2017. ^ "Denver Broncos Team Encyclopedia". Pro-Football-Reference.com. Retrieved December 31, 2018. ^ "Broncos relieve Head Coach Vance Joseph of his duties". DenverBroncos.com. Retrieved December 31, 2018. ^ "Broncos agree to terms with Vic Fangio to become head coach". denverbroncos.com. Retrieved January 10, 2019. ^ "Boxscore finder: Denver Broncos vs Seattle Seahawks – Pro-Football-Reference". ^ Rosenthal, Gregg (February 2, 2014). "Seattle Seahawks stomp Broncos for Super Bowl win". National Football League. Retrieved June 29, 2016. ^ Carter, Bob (July 5, 2005). "Elway led Broncos on "The Drive"". ESPN. Retrieved August 28, 2013. ^ Reilly, Rick (September 21, 2011). "Byner's fumble spoils Browns shot at 1987 AFC Championship glory". Sports Illustrated. Retrieved August 28, 2013. ^ Heisler, Mark (January 15, 1990). "This Time, Just Call It Elway : AFC championship: Bronco quarterback is at his best in 37–21 victory over Browns as Denver earns its third trip to the Super Bowl in four seasons". Los Angeles Times. Retrieved August 28, 2013. ^ "Denver Broncos Playoff History – Pro Football Reference". ^ Mason, Andrew (January 17, 2014). "Recalling the 2005 AFC Title Game". Denver Broncos. Retrieved January 17, 2014. ^ Caldwell, Gray (January 8, 2012). "Broncos Advance with Postseason Thriller". Denver Broncos. Retrieved August 28, 2013. ^ Renck, Troy (January 17, 2016). "Peyton Manning, Broncos beat Steelers, punch ticket to AFC championship game". The Denver Post. Retrieved January 17, 2016. ^ "Team » Denver Broncos". Pro Football Hall of Fame. Archived from the original on July 20, 2009. Retrieved September 3, 2012. ^ Mason, Andrew (November 2, 2003). "Broncology: So We Meet Again". Denver Broncos. Retrieved August 28, 2013. ^ "Boxscore finder: Denver Broncos vs New England Patriots – Pro-Football-Reference". ^ Lynch, Tim (October 16, 2008). "Denver Broncos @ New England Patriots; Through The Years". Mile High Report. Retrieved August 28, 2013. ^ "Broncos take advantage of turnovers, eliminate Patriots". ESPN. January 14, 2006. Retrieved August 28, 2013. ^ "Denver doldrums continue for the Patriots – The Boston Globe". archive.boston.com. Retrieved June 5, 2016. ^ "Patriots vs. Broncos – Game Recap – October 11, 2009 – ESPN". ESPN.com. Retrieved June 5, 2016. ^ Gasper, Christopher (October 7, 2012). "Lucky to see Tom Brady vs. Peyton Manning again". The Boston Globe. Retrieved August 28, 2013. ^ Renck, Troy (January 24, 2016). "Broncos hold off Tom Brady and Patriots, head to Super Bowl". The Denver Post. Retrieved January 24, 2016. ^ Saccomano, Jim (February 20, 2015). "Legend and Legacy: Orange's origin". Denver Broncos. Retrieved February 20, 2015. ^ a b c "White at Home in the NFL – Uni Watch". Archived from the original on April 25, 2010. ^ "Endzone's Denver Broncos Game-Used News & Price Guide Page". ^ "New uniforms for a new era". Denver Broncos. February 4, 1997. Retrieved October 16, 2017. ^ a b c Legan, Kenny (October 3, 2011). "Orange Crush". Denver Broncos. Archived from the original on October 5, 2011. Retrieved October 3, 2011. ^ Pomeroy, L.A. (2012). "Thunder: Denver's Favorite Bronco" (PDF). Modern Arabian Horse. Arabian Horse Association. pp. 62–67. Archived from the original (PDF) on November 14, 2014. Retrieved January 26, 2014. ^ "Broncos unveil new uniform and logo" (Press release). National Football League. February 4, 1997. Archived from the original on April 19, 1997. Retrieved June 29, 2016. ^ "Broncos' RBs turn in uneven performances". The Denver Post. August 4, 2010. Retrieved August 4, 2010. 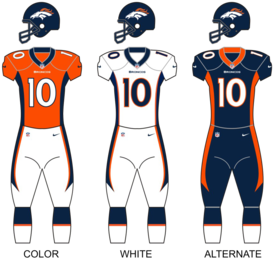 ^ "ESC's Denver Broncos Uniform History". ^ a b "End Zone Sports Charities" (PDF). ^ "NFL announces 2009 AFL 'Legacy Games'". NFL.com. July 19, 2009. Retrieved July 19, 2009. ^ Klis, Mike (October 10, 2009). "Even if they win, the Broncos figure to look bad in their throwback uniforms Sunday". The Denver Post. Retrieved October 10, 2009. ^ Klis, Mike (October 1, 2013). "Broncos to wear alternate blue uniforms vs. Cowboys in Dallas". The Denver Post. Retrieved October 1, 2013. ^ Mason, Andrew (August 20, 2015). "Blue thunder: Broncos to break out blue jerseys against Packers, Raiders". Denver Broncos. Retrieved August 20, 2015. ^ Swanson, Ben (January 25, 2016). "Broncos to wear white uniforms in Super Bowl 50". Denver Broncos. Retrieved June 29, 2016. ^ Mason, Andrew (September 13, 2016). "NFL reveals Color Rush jersey for the Broncos". Denver Broncos. Retrieved September 13, 2016. ^ Boniface, Daniel (December 13, 2017). "What do you think about the Denver Broncos "color rush" uniforms?". The Denver Post. Retrieved December 13, 2017. ^ "Guide To Sports Authority Field At Mile High". CBS Denver. October 25, 2011. Retrieved September 2, 2013. ^ Caldwell, Gray (August 16, 2011). "A New Home". Denver Broncos. Retrieved June 29, 2016. ^ "Broncos stadium renamed Sports Authority Field at Mile High". The Denver Post. August 16, 2011. Retrieved June 29, 2016. ^ Worthington, Danika; Wolfe, Cameron (July 27, 2016). "Mile High Stadium will get a new naming sponsor after Sports Authority, Broncos chief says". The Denver Post. Retrieved July 27, 2016. ^ "Training Facility". Denver Broncos. ^ "Denver Broncos and UCHealth announce major health partnership". Denver Broncos. July 30, 2015. Retrieved July 30, 2015. ^ "Denver Broncos Franchise Encyclopedia – Pro Football Reference". November 12, 2012. Retrieved November 12, 2012. ^ Caldwell, Gray (December 21, 2012). "Broncos Announce Stadium Upgrades". Denver Broncos. Retrieved December 21, 2012. ^ "BRONCOS ANNOUNCE 50th ANNIVERSARY TEAM". Denver Broncos. September 15, 2009. Retrieved April 10, 2018. ^ "Ex-Bronco Tripucka says Manning can wear familiar No. 18". National Football League. March 20, 2012. Retrieved June 29, 2016. ^ "Broncos to unveil retired number signage Sunday". KUSA-TV. September 13, 2016. Retrieved September 18, 2016. ^ "Denver Broncos to unveil retired number signage on Sunday". Mile High Report. September 18, 2016. Retrieved September 18, 2016. ^ Swanson, Ben (September 18, 2016). "Broncos unveil retired numbers tribute in pregame ceremony". Denver Broncos. Retrieved September 18, 2016. ^ Jones, Lindsay (July 31, 2012). "Ed McCaffrey joins KOA Broncos broadcast team". The Denver Post. Retrieved July 31, 2012. ^ a b "Broadcast Partners". Denver Broncos. ^ Espinoza, Annette (December 5, 2009). "Tim McKernan, "Barrel Man" to Broncos fans, dies at 69". The Denver Post. Retrieved December 6, 2009. ^ Parker, Ryan (January 24, 2014). "Denver Broncos owe success to "South Park" hilariously claim creators Parker and Stone". The Denver Post. Retrieved June 29, 2016. ^ Jhabvala, Nicki (August 11, 2014). "Robin Williams, aka "Mork", made Broncos history as first male cheerleader". The Denver Post. Retrieved August 11, 2014. ^ "Slow Getting Up: A Story of NFL Survival from the Bottom of the Pile". Goodreads. ^ "Fantasy Man: A Former NFL Player's Descent into the Brutality of Fantasy Football". Goodreads. ^ "Authors: Nate Jackson". Slate.com. The Slate Group, LLC. 2013. Retrieved August 22, 2013. ^ "Search results for "Nate Jackson"". Deadspin.com. Gawker Media. 2013. Retrieved August 22, 2013. ^ Jackson, Nate (December 4, 2012). "Murder Doesn't Shake NFL's Dream World of Consequence-Free Violence". The Daily Beast. Newsweek/The Daily Beast Company, LLC. Retrieved August 22, 2013. ^ "NYTimes.com Search". NYTimes.com. The New York Times Company. 2013. Retrieved August 22, 2013. ^ Jackson, Nate (March 5, 2011). "Why a Lockout Would Be Good for Football". The Wall Street Journal. Dow Jones & Company, Inc. Retrieved August 22, 2013. ^ "About". Caveman Poet Society Podcast. Retrieved February 21, 2019. Wikimedia Commons has media related to Denver Broncos.